This international bestseller is entertaining and insightful, as it guides readers on a spiritual journey of self-discovery, taking them to a place within themselves. Have you ever felt that "something" was missing, that there has to be more? This enlightening spiritual story guides readers to realize that the happiness they seek is inside themselves. A revision of the international best-selling original, this edition updates the content while adding a NEW section, which includes a study guide of discussion points and the author answering questions from readers; sharing his personal thoughts and experiences. Jonathan "Digger" Taylor is being stalked by an unknown "force" in his dreaming and waking worlds. Digger is a typical 90's type of guy: he's got a great sense of humor but he's paralyzed by a fear of emotional relationships, he's wrapped up in his sports and his music, and he's tormented by the memories of his parents and failed relationships, and a cross-country string of unusual "tragedies". When a breakthrough career opportunity steps up the pressure, Digger tries to cope through meditation. Suddenly he's pushing open a fancy door beneath a neon sign touting, "The Celestial Bar–food & spirits." The "spirits" aren't exactly what you'd expect, and the food seems to be directly connected to a feeling of well-being. Digger's adventures in The Celestial Bar change him forever–or more correctly, they remind him who he always has been. His colorful hosts–the Shoshone chieftain Ahmay, the doctor Mark, an interactive computer named Ramda, the beautiful waitress Paula, and a mysterious bartender called Zorinthalian–help him make the most of his visit, filling his plate with enough delectables to keep him occupied for several lifetimes. Youngholm's book is full of humor and good advice, breaking through barriers between this side and "the other side" with a sense of adventure that makes the journey seem easy and inevitable. The information is useful for anyone who wants something more from life, but hasn't taken the time recently for their own nourishing visit to The Celestial Bar. Who ever said spiritual wisdom-seeking can't be fun (as well as painful, exasperating, enlightening, and fulfilling)? Throughout most of my life, the challenging and even the happier times, I felt that something was missing. I didn’t know what it was, just that I didn’t have it. One day in February of 1987 while meditating, I drifted off to a place … a place beyond the walls of my memory. Over the next seven years, people, places, books, movies, geometric shapes, and music triggered a knowingness within me that was outside my apparent life experiences. After recording as much as I could remember, I have written this novel in an attempt to reconstruct my journey—my visit to …? Many of the characters, places, and events in The Celestial Bar have actually occurred in my life; I’ve changed some names to allow privacy. This book weaves a story that flows between the many realities of my consciousness. I now know they actually exist. To perceive these new realities, all it took was for me to change my focus. Then, I saw myself as being of spirit on a homeward journey, and that realization enabled me to walk my path in love and to more fully understand this world with all its joys, sufferings, and complexities; it was then that peace and balance began to find a more permanent presence within me. But it all began with my spirituality: my recognition of its essential role, and my willingness to take action on this new focus. The purpose of The Celestial Bar is to share my journey in hope that all of you will experience this exciting, wondrous, and loving new world with me. I know now all of us occasionally need directions, rest, nourishment, and friendship. Remember, none of us are alone in this quest. 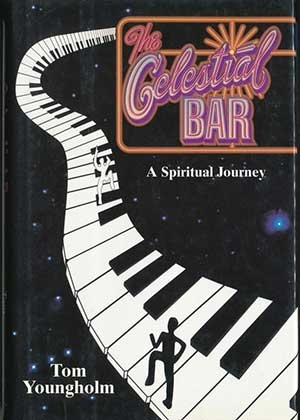 So if you’re feeling an empty aching in your heart or a missing “something,” drop in at my favorite place: The Celestial Bar. New books are available for this vintage work of visionary fiction. An autographed version is now available at a reduced cost.